Moammar Gadhafi of Libya has been elected as leader of the African Union, a position long sought by the eccentric dictator who wants to push his oil-rich nation into the international mainstream after years of isolation. Gadhafi, once ostracized by the West for sponsoring terrorism, has been trying to increase both Libya's global stature and its regional influence mediating African conflicts, sponsoring efforts to spread Islam on the continent and pushing for the creation of a single African government. Still, some African leaders offered tepid praise for the choice of the strongman who grabbed power in a 1969 coup. Rights groups called him a poor model for Africa at a time when democratic gains are being reversed in countries such as Mauritania and Guinea. He attended the session Monday dressed in a gold-embroidered green robe and flanked by seven extravagantly dressed men who said they are the "traditional kings of Africa." Gadhafi told about 20 of his fellow heads of state that he would work to unite the continent into "the United States of Africa." Gadhafi arrived at the summit Sunday with the seven men, one carrying a 4-foot gold staff, and caused a stir when security officials did not admit them because each delegation gets only four floor passes. All seven "kings" were seated behind Gadhafi when he accepted the chairmanship. "I think the coming time will be a time of serious work and a time of action and not words," he said. Diplomats who attended the closed-door meetings in which Gadhafi was chosen said several countries vigorously opposed him, seeking alternatives from Lesotho and Sierra Leone. However, the AU's chairmanship rotates among Africa's regions, and a North African had not chaired the continental body since 2000, when Algeria held the chairmanship. Meetings to select the chairman are held in private. The leader is usually nominated and then chosen by consensus. AU officials would not give details of the proceedings, including which countries objected. Even in public the reception to his appointment and the acceptance ceremony in which he invited two of the traditional kings to speak was measured. "I think his time has come," Liberian President Ellen Johnson Sirleaf told The Associated Press. "He's worked for it. I think it's up to us to make sure it comes out best." 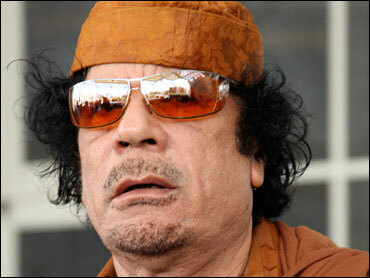 Still, Gadhafi appeared to cast his selection as a victory. "Silence means approval," he said during his acceptance speech. "If we have something and we are silent about it at the next summit it means we've accepted it." Since he seized power Gadhafi has ruled the oil-rich state with an iron hand and the often quixotic ideology laid out in his famous "Green Book," which outlines Gadhafi's anti-democratic and economic policies. In 2007, his regime released five Bulgarian nurses and a naturalized Palestinian doctor after eight years in prison for allegedly infecting Libyan children with HIV. The medics said they had been tortured in prison to extract a confession, a charge Gadhafi's son admitted to in a 2005 television interview. "The Libyan government continues to imprison people for criticizing Gadhafi," said Reed Brody, a Brussels-based lawyer with Human Rights Watch who watched Gadhafi take the helm of the AU. "Hundreds more have been 'disappeared.' Libya has no independent NGOs and the government tightly controls all forms of public expression." The large North African country is perhaps best known for the 1988 downing of a Pan-Am flight over Lockerbie, Scotland. All 259 people on board the flight from Heathrow to New York were killed when a bomb exploded. Another 11 people died on the ground. The bombing prompted United Nations-imposed sanctions and breaking of diplomatic ties with Britain and the United States. Libya has paid several billion dollars to the families of Lockerbie victims, and has accepted "general responsibility" for the attack. Sanctions have since been lifted and diplomatic ties re-established. Gadhafi renounced terrorism in 2003. Libya has also entered into deals with major oil companies for exploitation of its reserves and re-established diplomatic ties with the U.S. In Washington, the State Department declined to comment specifically on Gadhafi's election but said the United States would remain engaged with the African Union. Libya has never held the chairmanship in the 46-year-history of the African Union and its predecessor, the Organization of African Unity. This contributed to his being denied the chairmanship of the Organization of African Unity in 1982.